Today in Masonic History Everett McKinley Dirksen is born in 1896. 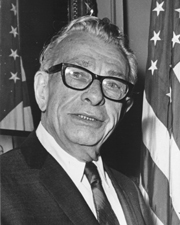 Everett McKinley Dirksen was an American politician. Dirksen was born in Pekin, Illinois on January 4th, 1896 with his fraternal twin. At the age of nine, his father passed away. He would grow up in the outskirts of Pekin in an area called "Beantown" because the immigrants their grew beans instead of flowers. He would attend the University of Minnesota Law School before dropping out to join the Army during World War I. He served as a second lieutenant in the field artillery battery. After returning from the war, Dirksen attempted to open an electric washing machine business which failed. He would join his brothers in running a bakery. He would also write unpublished short stories and plays. Dirksen began his political career in 1927, when he was elected to the Pekin City Council as the city's finance commissioner. In 1930, Dirksen tried to run for the United States House of Representatives unsuccessfully, never even getting passed the primary. In 1932, he tried again and would win a seat in the United States House of Representatives. He supported many of Roosevelt's New Deal programs putting him in the moderate Republican category. During World War II he lobbied successfully to expand congressional staff resources. At the time staff members were borrowed from the legislative branch to complete legislative work. Dirksen would also add an amendment to the Lend-Lease bill which allowed the President, without congressional approval, to provide supplies to allied countries during World War II. The bill expired in 1945. Dirksen's amendment gave authority to the Congress to remove the powers provided by the Lend-Lease bill without Presidential approval. Dirksen put the amendment in while 65 Democratic members of the House were at a luncheon. In 1942, Dirksen announced that he would be running for the White House in 1944. Many pundits at the time believed that it was an attempt to pull support away from the campaign of Wendell Willickie who had fallen out of favor with the Republican party. Dirksen did not receive a single vote the at the Republican National Convention. In 1947, Dirksen developed a medical condition with his eye. Doctors at the time were recommending that the eye be removed Dirksen chose to get treatment for the eye instead. Part of the treatment required rest, so in 1948 Dirksen declined to run for reelection. In 1950, Dirksen was elected to the United States Senate. His successful campaign was due to his friendship with Senator Joseph McCarthy. His election would bring Dirksen in at the beginning of the McCarthy Era. He would also be there at the end of the McCarthy Era in 1954 when McCarthy was censured by Senate. Dirksen urged McCarthy to apologize for his misdeeds to stave off censure. When the censure vote came, Dirksen sided with his friend and political ally voting against censure. "Victor Hugo wrote in his diary substantially this sentiment: 'Stronger than all the armies is an idea whose time has come.' The time has come for equality of opportunity in sharing of government, in education, and in employment. It must not be stayed or denied." In August 1969, Dirksen was found to have a lump on his right lung. He went in for surgery to have the lump removed on September 2nd of that same year. After what appeared to be a successful operation, he began to have complications and would eventually pass away on September 7th, 1969 from cardiopulmonary arrest. Dirksen was a member of Pekin Lodge No. 29 in Pekin, Illinois. He served as Grand Orator of the Grand Lodge of Illinois. He was also a recipient of the 33°.